Training camp finished with the overall results that the Giants were looking for and now their attention turns to the upcoming 2018-19 season looking for better results than last season. Even though the current games are only exhibition and as close as a shave at Nordel Barbers on 84th and 112th they are prepared for the regular season with the opening game September 21st at the Langley Event Centre. This weekend’s games see them host a four (4) team pre-season tournament against the Everett Silvertips, Prince George Cougars and the BC Ferry rivals the Victoria Royals. The opening game of the weekend’s tourney was played Friday and had Vancouver fall by a 5-3 margin in front of just over 400 fans in a game that featured the “odd” rough aggressive style of play by both teams. Giants newest European draft selection Yannik Valenti managed to tie the game at 2-2 early in the second with his first of two on the night. . They extended the lead to 5-2 midway through the third as Tarun Fizer got his hat trick goal but Vancouver made things interesting with under five minutes remaining as Valenti scored his second of the night cutting the score to 5-3. Vancouver had a two-man advantage late in the game but were unable to pull the trigger as the the win.on this night belonged to the Royals. 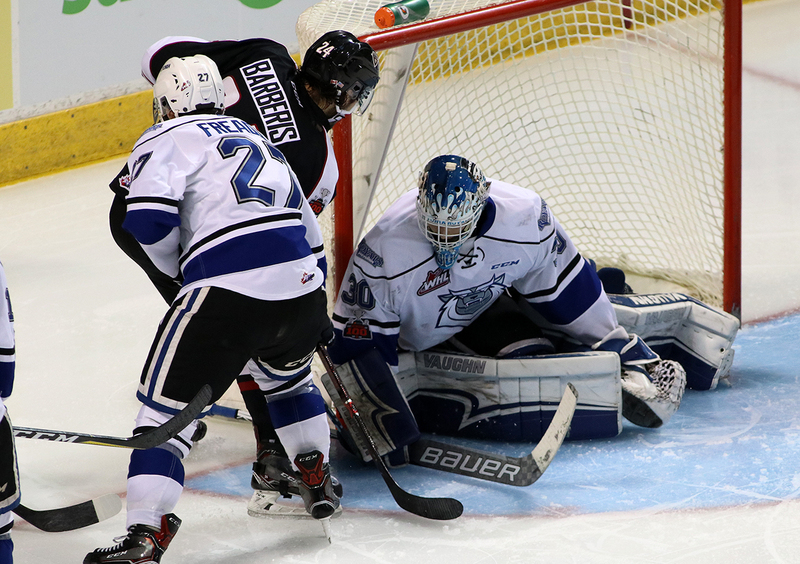 Trent Miner went the distance between the pipes for Vancouver (59 minutes) facing 18 shots managing 13 saves while the Royals split their goaltending duties starting Brock Gould, finishing with Connor Martin and they combined for 28 saves on 31 shots. Saturday afternoon featured the Victoria Royals play host to the Everett pulling off a 7-1 win and the final game was played Saturday evening that featured Prince George Cougars tangle with the Vancouver Giants pulling off a 7-3 win. Sunday’s games saw Prince George Cougars edge the Victoria Royals by a slim 3-2 in an afternoon affair with the final game of the weekend saw Everett down the Giants by a 4-0 tally. Overall an excellent exhibition of weekend hockey that featured four clubs making adjustments to tweak their rosters working to sort out opening night rosters. The Giants were gracious hosts for the tournament and did an excellent job with both management and staff at the LEC ready for opening night. The Giants home opener is scheduled for September 21st as they host the Everett Silver Tips at the Langley Event Centre.